Flip a coin. If heads, the Defending Pokémon will automatically get socked in the face. If tails, Anthony's punch will backfire, and hit himself in the face. Flip a coin. 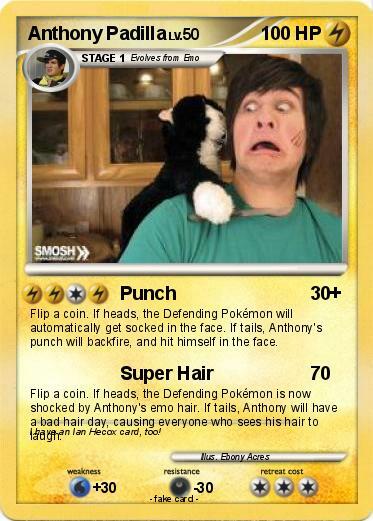 If heads, the Defending Pokémon is now shocked by Anthony's emo hair. If tails, Anthony will have a bad hair day, causing everyone who sees his hair to laugh. Comments : I have an Ian Hecox card, too!